Arsenic is part of the natural composition of minerals found in the soil and rocks in certain regions of Paracatu and geological formation of Morro do Ouro, where Kinross operates. The whole mining process in Morro de Ouro is controlled and monitored, and in compliance with the law, to ensure the quality of water, air and soil of the surrounding area. It is important to note that Kinross does not use chemical products containing arsenic or heavy metals like mercury in its production processes. Kinross follows well-established mining practices to prevent the release of arsenic during the mining process. Arsenic is naturally present in the ore and remains in its original mineral form. During the mining process, it is disposed in lined, specifically designed disposal facilities called “special tanks”. These tanks are lined with an impermeable sheet of plastic (PEAD) and covered with ferric clay. The tailings are stored in water to prevent oxidization and the release of arsenic into the air. They do not generate dust. Very little arsenic-bearing material is discharged to the main, unlined tailings dams. Water treatment of drainage helps maintain arsenic concentrations below detectable levels in the main tailings dam. All of our facilities and activities are covered by the appropriate environmental impact assessments and permits, which together with Kinross´s own standards and protocols, helps to ensure that any arsenic exposure is properly controlled and diminished. As noted by researchers from the Federal University of Minas Gerais and the University of Queensland, the amount of arsenic in airborne dust and soil is “insignificant,” or less than 5% in terms of the overall arsenic exposure in Paracatu. Regular monitoring by Kinross as well as independent analysis by CETEM has found no ground water or surface water contamination from Kinross operations. Regular monitoring of the water immediately downstream of the tailings dam shows arsenic levels to be below detection and water quality to be well within regulatory limits. 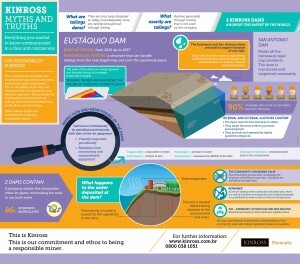 Kinross’ monitoring is consistent with the results of the CETEM study, which found water quality in the Santo Antônio Creek downstream of the dam to be well within regulatory benchmarks. For Kinross to be responsible for elevated arsenic levels in local rivers, the water quality immediately downstream of the tailings dam would necessarily have to reflect elevated arsenic levels, above Brazilian regulatory benchmarks, as well. Rather, these streams have been subject to uncontrolled, informal garimpeiro mining for nearly 300 years, which has caused significant environmental damage. This damage, which predated Kinross, has nothing to do with our operations.